Since the English Renaissance, women had made cautious but steady advances toward educational equality. When English universities finally began relaxing restrictions on female access to higher education in the 1870s, the move capped centuries of debate over womens education. Mary Astell (1668-1731) was one of the first English women to advocate the idea that women were just as rational as men, and just as deserving of education. First published in 1694, her Serious Proposal to the Ladies presents a plan for an all-female college where women could pursue a life of the mind. Well-reasoned and articulate, Astells ideas concerning female education were original and controversial. She was widely read in her own time and is hailed today as one of the first feminists. Mary Astell. 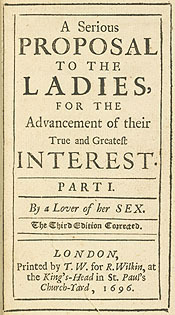 A Serious Proposal to the Ladies... London: Printed by J. R. for R. Wilkin, 1697.